Philip Rivers and Peyton Manning are both proficient at throwing footballs to people in the same color trying to catch them. This week's Thursday Night Football game is going to actually be fun! Let's break this bad boy down, yo. The over has hit in all but one of the first seven Thursday Night Football games this season. This week, the top two passing offenses in the league are going head to head in a game where both defenses have to stop unusually proficient offenses on four days rest. This game's going over. Both of these teams pass the ball at a ridiculously good rate. San Diego and Denver are one-two in the NFL in yards per pass attempt, separated by just .01 yards per attempt. Naturally, this means that both teams suffer in the rushing department. Both teams are in the bottom six in yards per rush, and are in the bottom third in rush offense DVOA. But what will really separate the Chargers and Broncos in this game is the defense of Denver compared to that of San Diego. Denver is ranked second in the NFL in DVOA, fourth in yards against per rush, and second in yards against per pass attempt. Their defense has arguably been as good as their offense this season, which shouldn't even be possible given how stacked they are on offense. San Diego, meanwhile, isn't terrible defensively, but will have trouble with the passing attack of Denver. The Chargers are 23rd in pass defense DVOA, which won't cut it against Peyton Manning and his army of golden receiving gods. 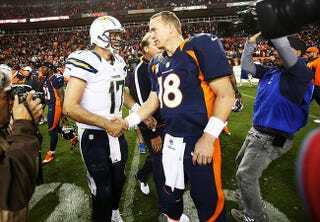 Regardless of outcome, this is going to be a great matchup between two of the best quarterbacks in recent NFL history. But San Diego's inferior defense will be their undoing, and the Broncos should win by double digits.